I spent a year abroad in the United Kingdom, where I did two separate exchange programs with the University of Warwick and King’s College London (KCL). Both universities are prestigious schools in the United Kingdom, which contained many famous leading opinion makers in the field of political science. It was an exceptional experience to be taught by these famous lecturers, who created modules, which were both unique and challenging. I took several modules such as inter alia, Critical Security Studies, Political Theory from Hobbes, Military Strategy, Asian Popular Cinema and The Politics of Globalisation, which helped me to broaden and deepen my interests in war studies, political theory and international political economy. In addition, the student experiences in both colleges were also nothing short of amazing. Both Warwick and KCL offered great support, in the form of different support staff from personal academic supervisors to even religious leaders at the multi-faith centre. I remembered feeling really touched at Warwick, when my supervisor offered to help me read and critique my political theory essay before submission to my module convener. Most of the lecturers that I have met were also really friendly and many of them seem to be really passionate in their subjects, organising several co-curricular activities such as talks and film screenings. Both institutions also provided numerous spaces for study. I remembered being in awe with the enormous Maughan Library at KCL. I was also really amazed by how the library is well-structured into several zones: discussion zone, quiet zone and even a very quiet zone where no laptops are allowed (absolute silence without even the sound of typing on a keyboard). This left me really really impressed. I was also fascinated by the non-academic student life in both universities. Both universities offered numerous clubs and societies including even watersports and extreme sports like sailing and skydiving. I decided to pick up something useful, so I signed up for the Royal Yachting Association (RYA) sailing course, which was partially subsidized by Warwick. In addition, I was also able to make many friends in both Warwick and King’s College London, through different activities such as orientation, after-class dinners and hall events. KCL is also located in a superb location, just opposite the famed Covent Garden (where musicals are staged in numerous theatres on a daily basis) and a short tube (train) ride from most tourist attractions and the main shopping belt of London. Life was therefore never boring in both universities. During my year abroad, I also managed to visit 35 cities in 17 countries, with the most memorable of these trips being a crazy road trip around Southern Iceland to see glaciers, icebergs, mountains and waterfalls in the middle of winter, as well as skydiving and mountain hiking in Switzerland. Being a history buff, I was also really happy that I managed to buy an antique bust of the late USSR leader Josef Stalin at an antique market in Riga. I thoroughly enjoyed all the different experiences that I had. I would not have been able to do all this if I did not receive a travel scholarship from the university. Thank you Monash for making my undergraduate life so vibrant and memorable. 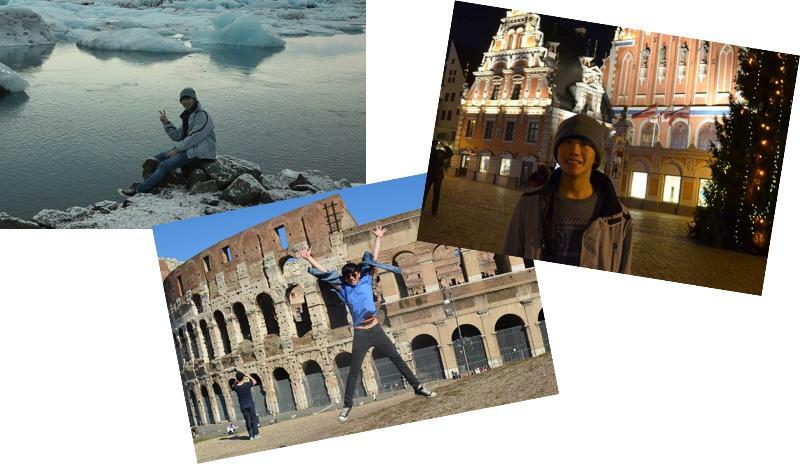 Find out more information about Monash Abroad Inter-University exchange here.